A decorating technique used in French restaurant to dress up a plate is to use timbale molds to shape side dishes on individual plates. A side dish of rice is so much more appetizing when it is served as a “timbale de riz” (rice timbale). 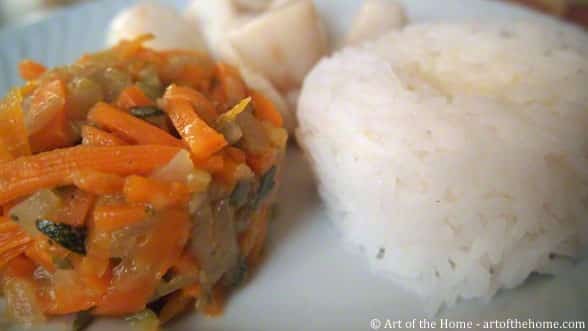 And who would not want to eat their veggies when they are served as a “timbale de julienne de légumes” (julienne vegetables timbale) – sounds so delicious! Another great advantage of serving side dishes using timbale molds is portion control — a key part of the French diet. If you don’t own timbale molds that’s not a problem because the odds are that looking around your kitchen you may already have all you need to dress up your plates and keep portions under control. Check below for 4 ways to give a new life to some of your kitchen accessories and bring a French touch to your table even on a weekday! Enjoy and bon appétit! Ramekins: used typically to make crème brûlée or other baked desserts, a ramekin can also be used as a timbale mold to serve a 1/2 cup timbale of vegetables or gratin Dauphinois. Measuring cups: in the above picture, using a 1 cup measuring cup, we presented the rice and julienne vegetables in a timbale next to sauteed scallops. A small dot of butter on top of the rice melted to the center — delicious and a big success. A small can with top and bottom removed: the size of the can can vary depending on the quantity you want to serve. Coffee cup: if you have coffee cups of various shapes, you can serve your side dishes in timbales of various sizes — a lovely touch. And if you really want to go for mini portions or serve a medley of side dishes, you can even use espresso cups. Prepare your side dish following your recipe. With a dessert spoon, fill up the timbale molds with the side dish. Gently press downwards. This will compress the side dish and help it hold its shape. Invert timbale mold onto individual plates and serve.